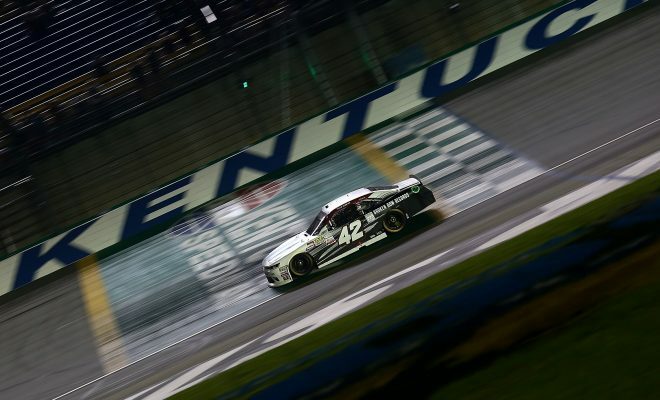 (via NASCAR Wire Service) SPARTA, Ky. – Running a partial NASCAR XFINITY Series schedule this season, Tyler Reddick spoiled the party for the opening round of the Playoffs by earning his first career win in Saturday night’s VisitMyrtleBeach.com 300 at Kentucky Speedway. The Chip Ganassi Racing driver took control of the lead 74 laps from the finish and never looked back. 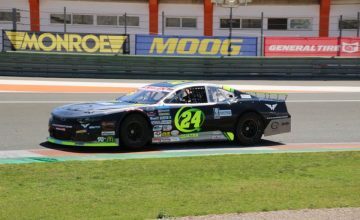 His 14.540-second margin of victory over teammate Brennan Poole was the largest in the series’ history at the 1.5-mile speedway in 16 years of competition. “I don’t know if it was necessarily me making a statement, it was just Chip Ganassi Racing making a statement,” said Reddick, who earned the triumph in his 15th XFINITY Series start. “Me and Brennan (Poole) were really fast all night. Poole earned a career-best finish behind Reddick, giving Chip Ganassi Racing its first 1-2 finish in XFINITY Series competition. Poole was also the highest-finishing playoff XFINITY Series Playoffs driver in the Round of 12. “I just think it was a strong statement tonight,” said Poole, who earned his second top-five of 2017. “I’m proud of our Ganassi team coming up one-two. This is really a track that we have struggled at in the past. To come out and be strong in the first race of the playoffs is pretty awesome. Playoff driver Justin Allgaier rebounded from a flat tire inside the event’s opening 25 laps and utilized a gutsy wave around call and the beneficiary of a Lap 75 free pass to bolt from a race-low 36th to finish third, his eighth top-five of 2017. 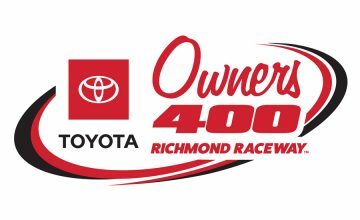 “My team at JR Motorsports obviously does a great job,” said Allgaier who is tied for the XFINITY Series points lead with Cole Custer. “We talked about not beating ourselves in the first Playoff race. It was unfortunate there getting a flat tire. It wasn’t in our control. We did what we had to do and persevered through it and we did a great job on pit calls and pit stops. NASCAR Next alumnus Kyle Benjamin in his fifth start of the season led the field to green after earning his second-career pole, until Stewart-Haas Racing’s Custer muscled his way to the lead on Lap 42 and clinched his first career stage win. With a two-tire strategy, Benjamin returned to the point to start Stage 2, but Custer soared back to the lead by the exit of Turn 2 on Lap 52 and dominated the stage to earn another 10 crucial stage points toward his playoff total. Defending race winner Elliott Sadler elected to stay out at the end of Stage 2 and led the field back to green for the start of Stage 3 until Iowa XFINITY winner Ryan Preece on a similar strategy throttled to the lead on Lap 105 passing Sadler off Turn 2. Reddick, with fresher tires, reeled in Preece for control of the race and made the pass on Lap 126. He checked out from the field until he pitted with 49 laps to go for his final pit stop of the night. Reddick cycled back into the lead 10 laps later, pulling away from the competition and ultimately setting the tone for the finish. Notes: Following the opening round at Kentucky, playoff drivers Jeremy Clements, Michael Annett, Blake Koch and Brennan Gaughan find themselves below the cutoff line for the Round of 8. William Byron suffered a loose wheel late in the race, leaving little time to recover, finishing 18th. Still, he remains fifth in the playoffs standings with benefit from the stage points he acquired during the 2017 season.